You can tell Easy2Sync to start this task when the computer is turned on or off (this does not work with the Easy2Sync service). You can configure this here. 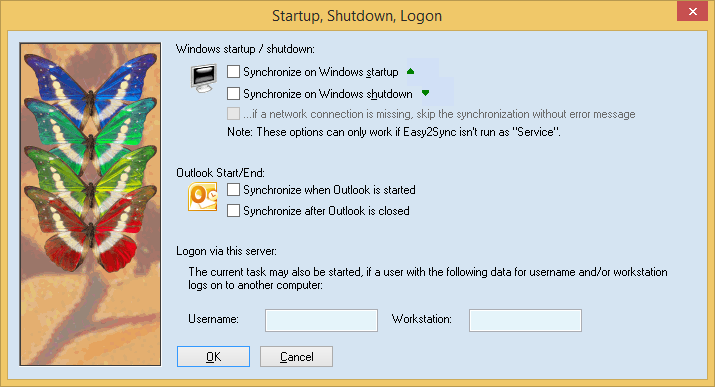 If you want Easy2Sync to run the task on the computer’s startup, you must configure Easy2Sync to be started when Windows is started. You can configure this in the options. If you want Easy2Sync to synchronize all tasks instead of just one, when starting or stopping Windows, you can configure this in the options, too. Finally, you may also tell Easy2Sync to start the current task if a certain user logs on to this server. This works only if the current computer is a server. The user does not have to sit in front of this computer. The idea behind this is, that the user logs on using his computer (somewhere else) which uses the network to log on to this server and so triggers the synchronization on this computer.